It’s been a while since I last wrote my blog… I’ve missed it! Keeping a blog is like conjuring the moment by recording what is going on in our lives, and sharing it with the world. It may be one, or nobody who reads this… I write it for me, I write it for all of you! The truth is that during this summer I’ve been so busy with the exhibition of Frida: Lust for Life, and the excitement of being part of the collective of the Artists Pool. This has been one of the best experiences of the year, and to meet talented people such as Renee Rilexie, who alongside her partner Thomas, made us all comfortable while producing a high quality exhibition at the Menier Gallery. So just before the new term starts we went to Cornwall to our favorite holidays of the year. 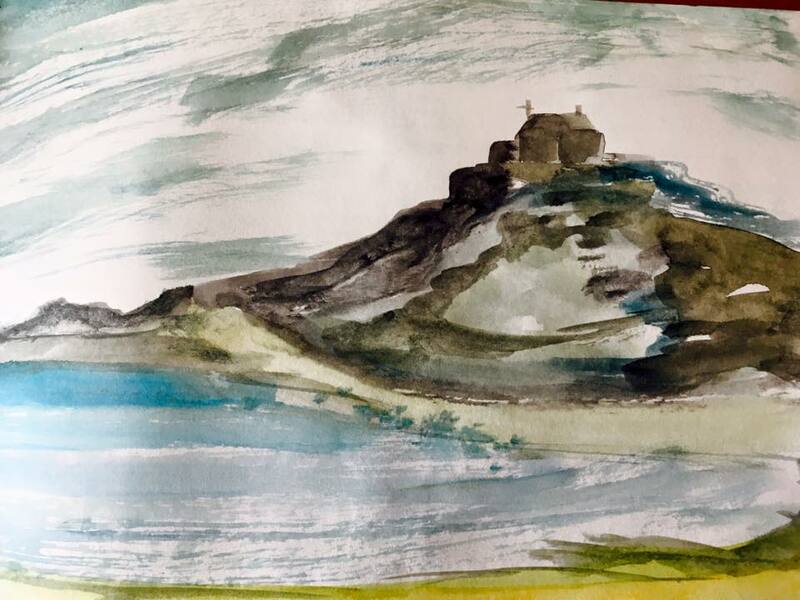 We stay in a wonderful cottage near Penzance, where I can indulge my love for sea swimming, refresh my eye-palette with the beautiful art of this region and indeed, try new experiments and projects. 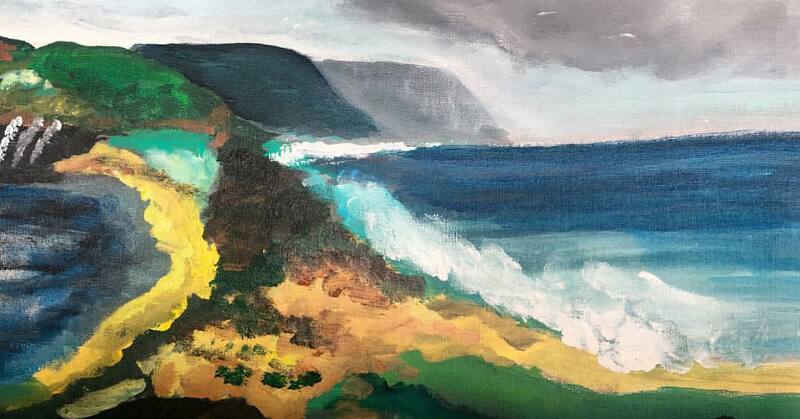 I have been working with my colleague, the artist Osvaldo Polo, on an idea about painting the two sides of the sea… “Opoloch Dibujos“, according to his Facebook page, is a Bogota’s painter born next to the Sea in Santa Marta (Bogota is 2600 meters high in the Andean mountains, and Santa Marta is called La Perla of the Caribbean Sea). His art dives into his “roots” and his strong connection with the sea in one of the most beautiful landscapes of Colombia. There the Atlantic becomes Caribbean… his work is truly amazing. 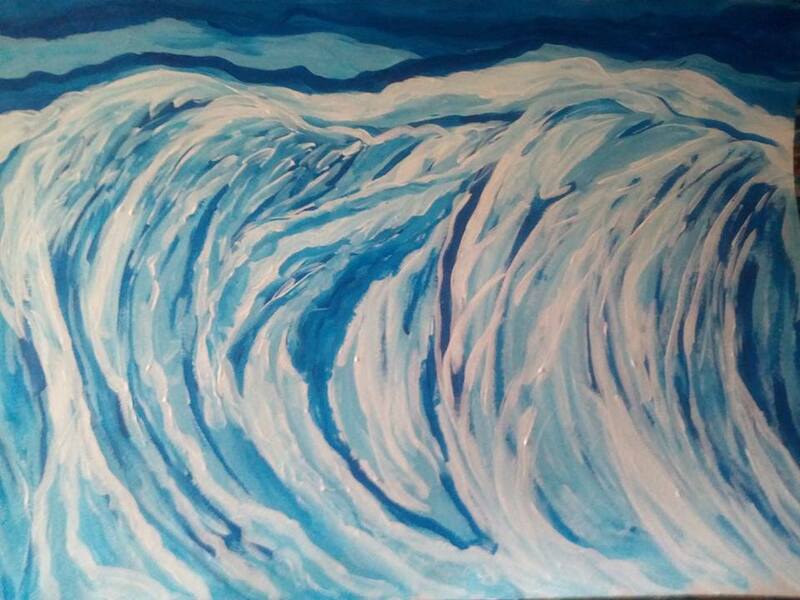 This is one of his “waves/olas”. Os and I have been pARTners in creativity for many years. He was the first person who saw an “artist” in me, and when I visited recently I was moved to see that he has kept many of my very early ouvre. He is super creative, and in the last few years took the plunge to dedicate all his time for painting (Painting is a exclusive mistress, Matisse used to say!). We’ve been wanting to do something together, a project or something, and we decided that it would be nice to depict the Mighty Atlantic of his work from this side of the planet: The Two Sides of the Sea. And what a better place than Cornwall for doing so. Cornwall is the most western county in this Island, a portion of narrow land perking into the sea, there you find the southern point and the westernest point of England, and it is indeed a very foreign place. First of all, the culture is quite different from the rest of the country, there is a chillax atmosphere, far away from the frenetic pulse of London, and the beaches and coastal landscape is a dream… You may think you are in Thailand or in the blue Caribbean, the colour of the sea conjures all shades and hues of blue: turquoise, ultramarine, deep prussia blue, yellowish blue, teal, aquamarine, emerald blue, it is just a dream! The scenery can be dramatic and alluring: high cliffs of multicolour rocks, formations of thousands of years, in the time of dinosaurs, the fossils testify for a long time in the planet… but also there are beaches of incredible golden sand, which in contact with the emerald sea makes your heart beats in peace, in love, in bliss! Apart of this propitious scenery, this time I decided to adventure a bit in my “drawing’. Normally I do drawings in ink on my sketchbook, as it is a matter of practicality.But this time, I decided to push away from my comfort zone and try to “draw in colours”. For that I made a better use of my mobile painting kit: a combination of neocolour watercolour crayons and Derwent Inktense Blocks, plus water pen brushes. The brushes carry the water, and I use the tin of crayons as a palette. This is a winning combination and the difference is amazing. Of course, there is always the fight of the sand, or the need to finding a proper sitting place where things are more or less flat, but in general, I could draw all over the landscapes…. That change was really fortunate… not only my sketchbook acquired more live, but also, it made me take notes directly in colour ready for potential paintings. I kept also another little drawing book with ink on paper, as this type of drawing is very dear to me, but the combination was enriching. Further, I took time to cut and paste in my sketchbook and make some notes as a way of journal to record the days and emotions of the travel. Some people can paint from memory (this is the case of Osvaldo and my friend Lesley), so they take time in “looking”. In my case, I cannot look without “drawing”, and I feel that by employing hand and inks I am able to capture to the moment. Later, when I revise my drawings I connect directly with the emotions of the day. The first few days I was so exhilarated, relaxed and so happy to be able to swim in the cold but not icy sea of September. I recorded my first impressions of the beautiful sea in front of our cottage. The calm and the titilation of the colours, the wide horizon… I took time every morning to salute the Sea in the Balcony of Prussia Cove. Another of my favorite places in Cornwall is St Ives, and we love taking the scenic train from St Earth to St Ives, where the colours are simply mesmerasing. Here there are some drawings from Porthmeor, the beach in front of Tate St ives, the St. Michael church and the beautiful sea. The sea takes many guises and this dramatism is superbly used by the Minnack Theatre. The scenery is made of the magnificent sea, flanked by ancient rocks and cliffs. It is breathtaking! This drawing was made just before the Play, on a very wet day…. This other drawing, for example, shows my awe at discovering the magical combination of the Lake (Loe Pool) and the Sea. This is a mythical lake, silver and vibrant with life and birds, it is said that King Arthur’s Sword, Excalibur, lies here. We had not been there before and we were just surrounding the lake in our walk, when we saw this roaring sea, the white horses splashing on the extensive sand dunes, the only bridge between the clear water of the Lake and the salty nature of the Sea. This was the first drawing I thought to do in my project and here it is the work in progress! The picture quality is not superb, but you get the idea. I hope to keep on updating this project as I am truly excited about this! i love the glimpses of your sketchbooks – brilliant to try out something new.